Buy Palladium: Where Can I Buy Rhodium Coins Rhodium Bullion? I want to Buy Rhodium Coins! 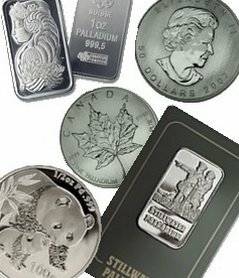 Many people ask about buying rhodium coins or rhodium bullion. To make the answer short: there are no rhodium coins or bullion. This is not to say you can't invest rhodium, but it's not as easy as gold or even palladium. Rhodium: brittle. If it were in coin or bullion form, it could easily break. Rhodium: popular. No one really knows what rhodium is. If governments were to make a coin with 90-some percent rhodium, there would be very little interest. Uses for Rhodium, What Uses Rhodium? What uses rhodium? 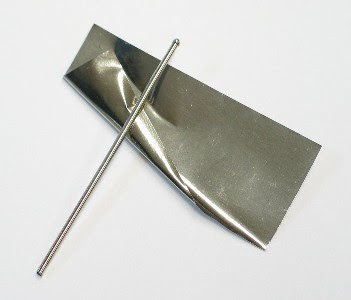 Rhodium is a good conductor and catylist. 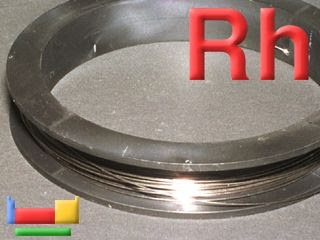 Rhodium used in special types of wire and is mixed in most catalytic converters in cars. In fact, it can be salvaged from these catalytic converters and sold, if you can find a buyer. Jewelry makers use rhodium. Rhodium coating on jewelry makes cheap jewelry shine as well as platinum or palladium jewelry. Rhodium is expensive, but they use such a fine coat if it that it's worth next to nothing. TIP: put Windex on a paper towel and rub it on some cheap rhodium-coated jewelry. You'll see rhodium on the paper towel! Rhodium Pictures: I want Rhodium Photos! I added a few rhodium pictures to this page. The top picture shows you the white, silvery shine of a sheet of rhodium. The next picture is pure rhodium in it's raw, but non-powder form. Below you have rhodium wire, and rhodium-plated ring. There is a lot of rhodium-plated jewelry. I ring or a necklace can be a cheap rhodium as $5.00. You won't get much rhodium off it though! There are in fact rhodium coins being made by savvy refiners who are trying to solidify their sales a bit in the face of the global slowdown. I have requested a quote at 1/2 ounce if that is logistically feasible, and hope to split the order evenly between full ounce and 1/2 ounce quantity by weight. If anyone has interest, email me at mty@circpros.com and I'll keep you posted on a date I can have then in hand. The producer talked like they only make these for special orders, with a turnaround of 3-4 weeks. If we get the details worked out, I'll be ordering this week. You can purchase Rhodium Coins in 1 grams increments from American Elements Mint at http://www.americanelements.com/rhmbcn.html They're not cheap! But one gram increments make them reasonable. E Cohen Mint may be selling 1 gram rhodium in the near future. Cohen Mint is a scam. Read up on the complaints about them. Every one want to save there wealth physically gold bullion is good choice.Thanks for the great reading, we buy gold coins in a recession. I will pass this on to our Ira clients to read. Another TIP, If you have a high palladium white gold jewelry piece like a rope chain for example & do the Windex on it to see if its rhodium plated, odds are it may not be. But if it is, you won't see much difference in the appearance. Chances are, the metal underneath can be just as bright & white as the rhodium if it does happen to be rhodium plated at all.